Structural Preservation Systems, Deer Park, Texas, collaborates with clients to improve infrastructure by combining specialty construction, repair and maintenance services with proprietary technologies to provide innovative solutions for demanding engineering and construction challenges. A major industrial petrochemical facility in the Gulf Coast needed to re-seal their sulfur pit – a Claus Sulfur Recovery Unit – where recovered molten sulfur is stored. 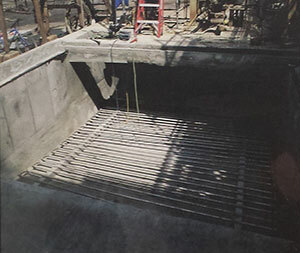 The pit is a large square reinforced concrete box lined with steel plate incorporating a refractory liner and a stainless steel partition wall which runs the length of the pit. The roof (lid) of the pit is a series of pre-cast reinforced concrete panels, which were sealed with a gasket material at each joint location to eliminate vapor emissions to the atmosphere. During maintenance and restoration activities, when the refractory liner is installed overtop of the steel plate, the refractory materials have a high water content and require a specified dry-out (controlled heating of the refractory) period before the unit can be put into elevated-temperature service. Unfortunately, during this process, the stainless steel partition wall “lifted” the precast concrete panels, due to stainless steel expanding 1.5 times more than concrete and carbon steel (which have very similar coefficients of thermal expansion). The refractory dryout was temporarily suspended. The panels “reseated” themselves as the pit cooled. However, although the panels were reseated, the previously installed panel joint seals were compromised. Once the damaged seal conditions were evaluated, engineering measures were taken to ensure the panels would not “lift” during the dryout or operation of the unit. The sulfur pit concrete panel seals had to be redesigned and the new design implemented into the work prior to commissioning. Resealing while the sulfur pit was in service and “hot” was not a viable option. Structural discussed the proposed repair procedure with Pelseal Technologies, the leading manufacturer of high performance liquid fluoroelastomer products. Pelseal walked through the problem with Structural and recommended the company’s PLV 6032 fluoroelastomer coating and Pelseal 2690, a fluoroelastomer caulk. “We talked about the repair procedure with Bill Ross of Pelseal, who was a big help,” said Structural’s Project Manager. The failed joint sealant materials on the topside of the panels were totally removed, and then all precast concrete panel joints were mechanically abraded and cleaned. 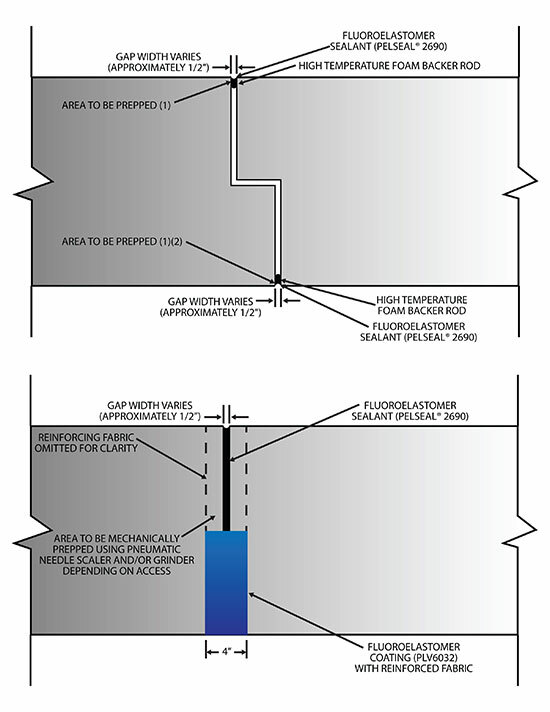 The joint cavities were filled with a high temperature backer rod, leaving an approximate quarter-inch depth from the center of the backer rod to the exterior edge of the joint. The cavity was then filled with Pelseal 2690 sealant. The Pelseal 2690 sealant was installed in two passes, with two smaller adjacent beads to assist in the curing of the material and to help prevent sagging. A secondary seal was applied to the exterior joints. A priming coat of the PLV6032 material was then applied 3-4” on each side of the joint, just thick enough to completely cover or “wet” the substrate. Next, a polyester reinforcing fabric was centered over the joint and installed in the “wet” material. Then, the PLV6032, was applied to the fabric and tooled-in to completely saturate the fabric. Once the PLV6032 material became tacky, additional coats were applied to smooth in the fabric. Additional amounts of the PLV6032 material were placed on top of the system for a secondary seal. According to the Project Manager, “With the PLV6032, we were able to put a piece of reinforcing fabric on top of the exterior joints. We then saturated the fabric with the 6032, providing an additional seal over the primary joint seal." 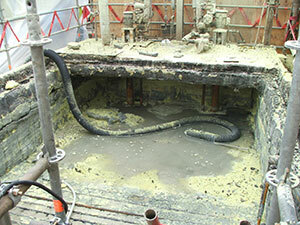 Following the re-sealing of the pit, no leaks were detected during the refractory dryout period or subsequently once the unit was put into operation.